I bought a plant from the local market and it has fat dark green leaves. The newer leaves are a shade of light green. On the outside edges of the leaves, there is pink tinge on the lighter leaves, and a dark tinge on the red. It has a brown stem. Any ideas on what its called?? 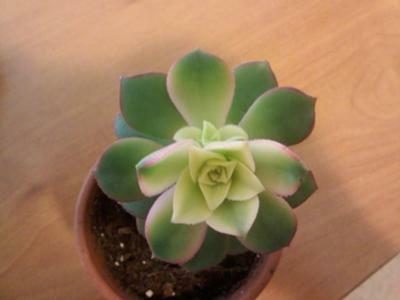 Ryann - you have randomly purchased one of my favorite plants! It's the lovely and ever changing Aeonium haworthia 'Kiwi' which you can find out more about on the Aeonium page. In the winter, it will retreat into hiding, and turn into pure green with none of the beautiful pink and gold coloring, which then returns with the warm weather. See also this page from a visitor from California of this plant growing at the Pixie Restaurant in Aptos, California.